How Does a Black Anodised Banana Balls Adorn with Your Look? Black anodised banana balls are kind of body piercing that is very sensitive to attached in the body. It requires one of the most intricate work of body piercing as much as mandible piercing. Mandible piercing is a new piercing in the list of body modification activity. It is also gaining popularity among the young men and women. The location of this piercing is totally unique. It also starts in base of tongue and passes through the layers of tissue before coming out of the chin. 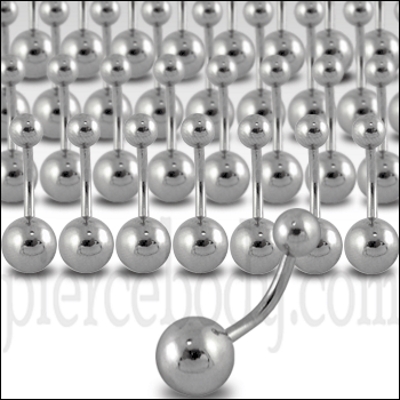 Different types of body piercing procedure also known as deep tissue piercing, sprung piercing, and jawbone piercing. You can argue that this is a chin piercing. But there is a difference between chin piercing and mandible piercing in the terms of location and procedure. The black anodized banana balls has a 16g barbell and looks good on both men and women. The balls are 8mm which are perfectly visible through the chin from a distance. Since this is an anodized product it will be durable and comes at a reasonable rate from piercebody. Piercebody understands the pulse of the buyers and stores various kinds of products in inventory to cater to various kinds of customers. For bold and experimental buyers and piercing enthusiasts Piercebody has a great collection of items. Mandible piercing is a difficult piercing and therefore very few piercers actually take up the task. In fact, only the ones with enough experience and confidence take up the task of mandible piercing because it passes through cartilage, muscular tissues close to nerves. It is understandable that this piercing requires more time to heal than any other piercings. This, making aftercare an important part of the healing period. Oral juices come out during the initial phase of healing which must be taken care of following the instructions of the master piercer. Special mouthwash recommends for the piercing procedure. If you can keep the piercing for around 2 years, then you will be in the list of those esteemed few who have been able to pull it off.